If you’re like me, sometimes you’re in the mood for a sweet love story to make you laugh. After all, life can be hard, and laughter is the best medicine (Proverbs 17:22). 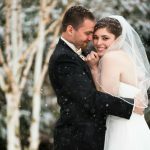 I highlight some of my favorite funny but romantic reads below. 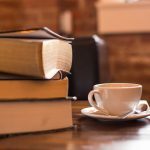 Whether you’re a fan of historical fiction or prefer a more contemporary setting, the clean, classy love stories listed here are sure to make you giggle as you read. 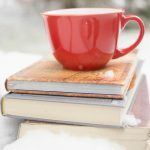 If you like books by Jan Karon–such as her hilarious Mitford series–then you might like these! 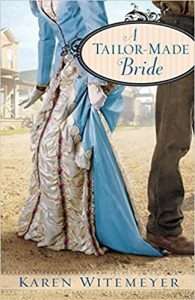 Hysterically funny and well-researched, A Tailor-Made Bride is an engaging historical read that will leave you thinking about the characters long after you’ve turned the last page–which in my estimation makes it the best kind of book. The love story at turns unfolds like a rose and whirls like a waterfall. The clashes between the characters made me laugh, and the author’s signature witty style shines. Also, the bit of intrigue woven in added a dash of adventure. When Charlotte and Joel are coerced into planning a fundraising gala for the hospital, will this combustible pair explode? Lorna Seilstad writes in an engaging, humorous, but heart-stirring style. That’s a talented combination. When the OCD tendencies of the hero, Joel, were revealed in early chapters, I could relate–and laugh at him. Charlotte, on the other hand, is a free spirit. The combination made for highly entertaining reading. About two-thirds through the book, the pacing picked up significantly, and for a short while I felt a little lost with all that was happening. But toward the end, I found my way again and Seilstad expertly steered me toward a satisfying ending. 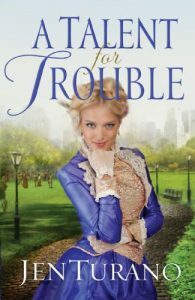 Everyone else may think them a match, but nothing could be further from the truth–until Agatha finds herself in real trouble. Jen Turano’s writing style is uniquely funny and kept me reading about Agatha’s adventures long after I should have turned out the light on my nightstand. Jen writes in a fresh and amusing way that doesn’t distract from the intriguing storyline. Not only is Agatha a talented journalist, she’s one with an assassin after her! By the way, I don’t think I’ve ever read a book where the hero was laid up pretty much the entire time with a broken leg. That made for some interesting escapades. At the end, even the twist on the assassin’s real identity caught me by surprise–twice. 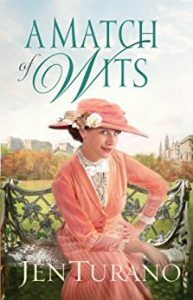 Even with all the suspense, A Match of Wits is one of the funniest books on my bookshelf. Yes, another Witemeyer book! Let me tell you why I love this author’s humorous style: featuring the hero as an English nobleman turned sheep farmer, this book is filled with all sorts of silly conundrums and ironic twists of phrase. 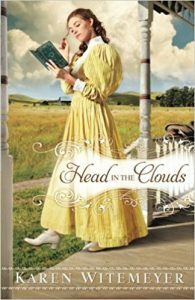 The glimpse on the cover of the heroine, Adelaide, about to tumble off the front porch is in every way indicative of the adventure to be found within the pages of Head in the Clouds. 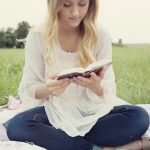 For Christian fiction lovers, this book presents the faith-filled life in a way that is neither over-the-top or under-done. And for romantics like myself, Adelaide’s oft-addlepated escapades in the name of love are hysterical. Will they want to spend the rest of their lives keeping one another out of trouble? One more Turano book! I’ll never forget how I burst into laughter in the middle of my college campus while reading this book on a study break during senior year. Another time when I was reading over breakfast, something so hysterical happened in a scene that I almost dropped my book into my cereal. But what I liked best about this book was that it wasn’t just funny. It has depth, too. Turano weaves in a Christian message that never once drowns out the story–or the humor. Mary Connealy has a fresh writing style that is capable of both tickling my funny bone and touching my heart with an inspiring theme. Connealy is probably best known for writing cowboy stories set in the Wild West. 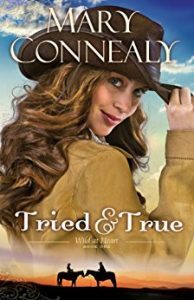 Tried and True, a story about the three Wilde sisters, is no different–except for the gender of the cowboys! Kylie Wilde, the main character, is not too wild to relate to, though. I loved that she is not so much tomboyish as she is a fan of pretty things. Still, she lives in Idaho Territory. Pretty things are scarce, so Kylie settles for dreaming of returning to “civilization.” Enter Aaron, and the plot takes crazy twists that only added to the hilarity. 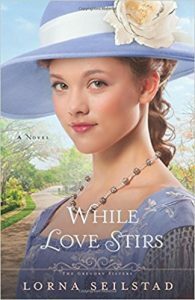 Although historical romances may be my favorite, Betsy St. Amant has written this contemporary love story to be as delightful as the cupcakes her main character creates. The first thing I loved about this book was the main character, Kat. She’s brave, but only in the comfort of her own kitchen, because her family doesn’t support her entrepreneurial ventures. But her best friend is about to change all that by entering her into a cupcake competition! Which provides the perfect setting for Kat to discover just how brave she can be, and for Lucas to learn a few things about being the hero, too. The way Betsy brought it to a close was masterful. 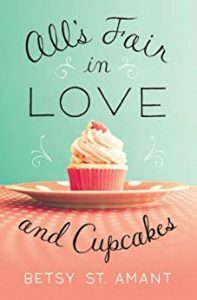 If you’re looking for a sweet, Southern summer read with an encouraging message, pick up All’s Fair in Love and Cupcakes. I’m currently reading the sequel (Love Arrives in Pieces) about Kat’s sister, Stella, and finding it just as fun (and funny!) as the first. How many times can a girl discover someone else’s gown without dreaming of the day it’ll be her turn to wear one? Witty and full of asides that made me laugh out loud, Joy crafted a humdinger of a contemporary love story sure to make you laugh. I have the privilege of sharing a publisher with Joy. 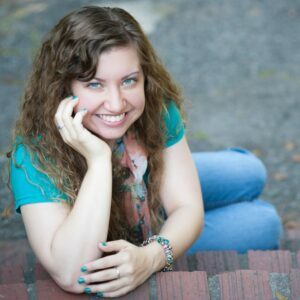 We’re both the youngest writers in the WhiteFire stable, and I’ve so enjoyed getting to know Joy. 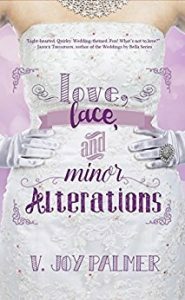 I also enjoyed getting to know Izze, Joy’s main character in Love, Lace, and Minor Alterations! She’s delightful, real, and quirky. If you love the show “Say Yes to the Dress,” you’ll adore this book. I heartily recommend these books above if you’re in search of some light summer stories to read on the front porch swing on breezy evenings. Be prepared to laugh! Have you read any of them? I’d love to hear what you think in the comments section below. Thanks for your recommendations. It’s often difficult to find good (clean) fiction these days. I’ve already downloaded the last two. Blessings.